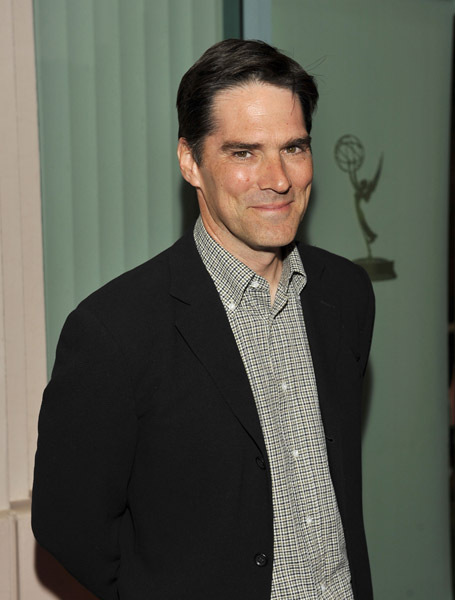 Thomas Gibson did a 180 when he took the role of a hardened FBI behavioral analyst in the CBS drama Criminal Minds. His somber character Aaron Hotchner couldn’t be more different from preppy newlywed Greg Montgomery in Dharma & Greg, which ran from 1997 to 2002. Gibson, 49, is OK with Hotchner’s dark side on the show, now in season 7. He’s been a fan of crime stories since he was a kid growing up on Charleston, S.C., with a leaning toward “quirkier’’ detective shows, like Columbo, Kojak and The Rockford Files. He admits that Criminal Minds, which focuses on what make killers tick, is heavier fare. But alluring nonetheless. “I am always fascinated reading about these kinds of cases, serial crimes, when I come across them. It’s always interesting to me to see what happened to this [person] that took them from one place that was more functional to this place of severe dysfunction. Maybe there was a little bit of that brain chemistry that was different, but they started out essentially the same as you and me.’’ As if Hotchner’s career weren’t depressing enough. Twists and turns in the scripts that followed had him facing unthinkable tragedy in his personal life: the crumbling of his marriage and ultimately the death of his wife. No worries; things may lighten up soon. “We’re exploring colors that are potentially available to him,’’ he explains. “We’re introducing a possible relationship, which is nice and gives us another challenge. Maybe we’ll see him get a little of the relief that he probably needs and maybe the audience needs too.’’ Gibson is happily surprised that the show has endured. “Who would have thought? We figured we’d be in for a few and out in the first season,’’ admits Gibson, who also costarred on Chicago Hope.